Sam had always dreamt of getting married in Spain so she contacted us in the hope we could help her make her dreams come true and she could get married to the man of her dreams on a beach in the Spanish sun. We discussed her requirements; guest numbers and ideal location along with a guideline to her budget so we could begin the search and help her to start to plan her big day. Sam flew out for a week-end and one of the Sunshine Weddings Spain team met her & a friend at Malaga airport, we took them on a drive along the coast to a number of beach wedding venues. 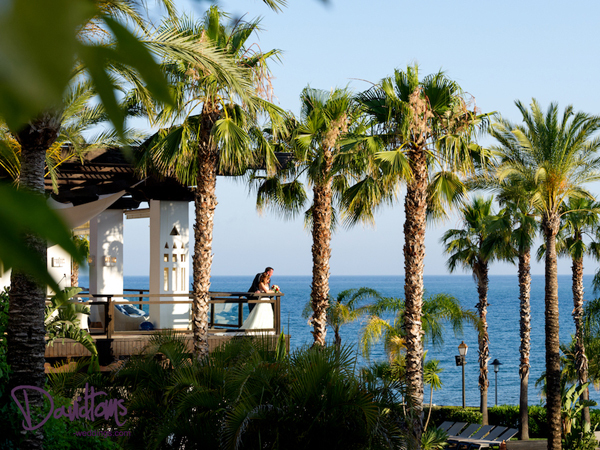 After a full day of touring and seeing the various options available, Sam sat drinking a jug of refreshing and well earned sangria, and as she watched the sun setting over the Mediterranean Sea knew she had found her dream beach wedding venue in Estepona Spain. Sam flew back to the UK and started to plan her wedding in Spain with her family. The invites went out and everyone booked their flights into Malaga airport, a short 2 and half hour flight from their nearest airports. Guest flew out mid September ready for Sam & James’ big day knowing they would be with their dearest friends and see them get married in Spain. And so the day arrived, such a special day for Sam & James to be able to experience the moment they had been waiting for; getting married at a beach wedding venue in Estepona Spain. Guests arrived at the secluded beach wedding venue in Spain where they sat and drank Pimms & lemonade shaded from the sun whilst waiting for the stunning bride Sam accompanied by her 7 beautiful bridesmaids. And so Sam entered bare foot in the sand, as she had always dreamt of, walking towards her amazing husband to be James with the Mediterranean Sea glistening in the background. The beautiful and light hearted ceremony took place, and whilst guests enjoyed canapés and drinks with live jazz music playing in the background, David Toms took the most amazing photo’s for the couple to remember their special day; getting married at a their beach wedding venue in Estepona Spain. Dinner was an arrangement of BBQ and Argentinean meats and once eaten the party carried on well into the early hours. Congratulations to Sam & James, what an amazing day! We were so honoured to be a part of your wedding and to have finally have made your dreams come true and helped you organise your beach wedding in Spain.